People often talk about why they volunteer. From benefiting communities and making a positive change, to finding new friends and developing skills: everyone has their own reasons why volunteering is for them, and all are valid. We talk a lot about the benefits of volunteering but often less about the how. Maybe you have decided you’d like to volunteer but are not sure what steps you need to take to get started. Read our three points below to get you on the right volunteering track. What cause do you want to volunteer for? What size of charity you want to be become a part of? What skills you can offer? What do you want to get from the opportunity? Some people might find this straight forward; for others it may take a little longer to work out. One-off volunteering is a fast, fun way to volunteer that is usually activity based, meaning you can see the impact of your volunteering on the day itself. ‘One-offs’ last from a few hours to one day and all training is provided on the day. At most you will need to fill out a simple application form beforehand. The LSE Volunteer Centre team meets any students wishing to travel to the volunteering location as a group on campus: the train or bus ride offers a perfect opportunity to chat to like-minded students from a wide cross section of the University. ‘One-offs’ allow you to try out volunteering if you’ve never done it before, see how a charity works on the inside, make friends, and try something new. 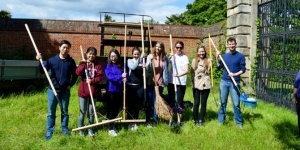 So far LSE students have been involved in a wide range of one-off tasks: they have painted, transcribed, sorted, conserved, collected, gardened, picked, and sung. There are plenty more projects on the horizon so keep an eye on the events page and sign up with a few friends! On-going opportunities are the most typical types of role available and therefore make up the majority of the roles promoted by the LSE Volunteer Centre on CareerHub. On-going opportunities offer a chance to develop your own skills and build relationships with a charity, allowing you to become a real part of the team. It can offer a window in your week where you step outside of your usual bubble and have conversations with people you might not otherwise cross paths with. The amount of time you would commit to an on-going role varies greatly from opportunity to opportunity. Time commitments can range from ad hoc arrangements, a few hours a week, a few days a week or perhaps a few times a month. Most charities will ask for a commitment of at least a few months to allow them to train you in the role before you move on. Some roles which involve helping with a particular piece of work, or building relationships (for example with vulnerable adults or children) might ask for a commitment over a 6/12 month period. Application processes for on-going roles will be more comprehensive than those for one-offs. Filling in an application form and meeting the organisation ahead of your volunteering for an informal interview is quite common, and demonstrates that the organisation makes time to select the right volunteers – a great sign of good volunteer management! While this can take a little time – don’t be put off. Overseas volunteering offers a way to contribute to an overseas project or cause. Sustainable overseas volunteering opportunities will usually last from at least a month, all the way up to two years (although usually a few months is typical). Overseas volunteering allows you to use your existing skills whilst immersing yourself in a difficult culture and the benefits to both local communities and volunteer can be vast. Like with on-going volunteer roles, you should expect to fill in an application form and undergo any necessary checks if working with vulnerable adults or children. Some organisations might ask you to fundraise in order to cover the cost of your accommodation, food or travel while on the project itself. The government currently partners with several overseas organisations to offer part funded overseas volunteering projects. Check ICS for more details. There are many excellently run projects, charities and NGOs worldwide but there are also many which are poorly run, that do more harm than good to local communities. To make sure you make the right decision, and to insure your overseas project has the positive impact you are aiming for, make sure to do your research. Have a quick read of our blog post on the debate on overseas volunteering and see the advice page on our website. The LSE Volunteer Centre works with hundreds of charities and has a minimum of 200 voluntary opportunities on LSE CareerHub at any one time. So the best way to start finding out about voluntary roles is by running a quick search. Make sure your LSE CareerHub preferences include volunteering to ensure you receive the Volunteer Centre newsletters during term time with upcoming events and highlighted roles. Although many charities promote their voluntary roles through the LSE Volunteer Centre and CareerHub, there are still many more out there! Often there are ‘hidden’ roles, where a charity might not know that someone with your skill set is looking to volunteer. Make contact with charities that you might like to volunteer with and let them know you’d like to help, as well as what you can offer. If you feel CareerHub is lacking a particular type of role, let us know by dropping us an email at volunteer@lse.ac.uk. If you’re looking for more help to get started, you can make an appointment with David Coles, Volunteer Centre Manager who can talk through your ideas and give advice. Why not get started with an on-going volunteer project, try some one-offs when you’re more pushed for time with studies, or spend the summer volunteering with a worthwhile project overseas?